Veteran Eric Bivins serving his country. In her open letter (summarized and slightly edited below), Debbie describes the heart-wrenching conversation she had with Kimi Bivins, whose husband Eric (a Marine Veteran), had committed suicide after the callous indifference shown by doctors at the VA to his PTSD and TBI. 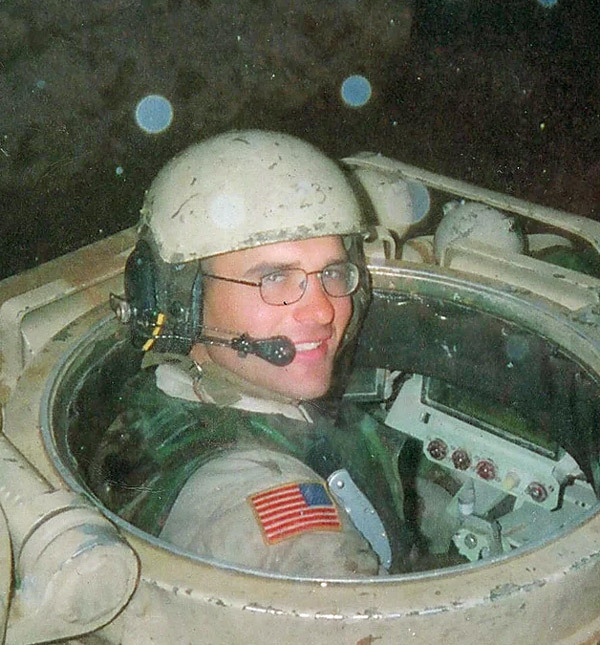 Several weeks ago Veteran Eric Bivins reached out to us via email for help with his PTS (Post Traumatic Stress) and getting into Hyperbaric Oxygen Therapy treatments. We replied to his email and told him we would be glad to help. He was scheduled to start Aug 2nd at Rocky My Hyperbaric. I didn’t hear anything back until Wednesday when his wife called. She informed me that her husband had committed suicide. She was calling to try and get HBOT for her husbands friends he had served with. We are working to connect with them to provide HBOT to provide healing and hope. Over the last 4 years our foundation, America’s Mighty Warriors (“AMW”) has been an advocate to make this standard of care at the VA and with Tricare. We have paid for over 30 Veterans to receive this 2 month treatment. Every Veteran we sponsored who received treatment has received improvement with their symptoms for PTSD/TBI . We spoke for about and hour and she shared that her husband was super excited about getting the treatment and had hope for his future. He had numerous problems with the VA in Tennessee. Long story short, his last visit at the VA was with the Chief of Staff, Dr. John Nadeau to at that facility. When Eric shared his excitement for getting the HBOT treatment Dr Nadeau told him several times that HBOT was a waste and that people were just trying to scam him for his money. His wife said he left a defeated man and had his hope crushed by that doctor. We both agree that her husband’s blood is on that doctor’s hands. They had numerous botched surgeries and doctors who disrespected and misdiagnosed or wouldn’t diagnose his medical problems. Eric had been sober for about 18 months and that next day started drinking and ended up taking his life after several days of abusing alcohol and prescription drugs. I am working with her to expose this atrocity. She has two daughters who are 12 and 10. I spent about an hour on the phone with her tonight just listening and providing comfort. While we were talking I asked when social security would kick in for her kids and she said hopefully August. I asked about insurance and she said none. I asked how she was doing financially, and she said they are struggling. Then she shared that her roof caved in a few days ago and that they had their roof replaced two years ago and it wasn’t done correctly and they insurance will only cover $2000 in “rot” damage, not the replacement costs. AMW did a Random Act of Kindness for Kami and her children to help during this difficult time and sent a check for $5000.00. This program was started in response to my sons amazing last letter home. He mentions that Random Acts of Kindness could change our world and I know when I shared with Kami what our board had approved her life was changed, and she was deeply moved. Please help us to expose another VA that is responsible for killing a Veteran and the help and healing that HBOT is providing for our Veterans struggling with TBI and PTSD. I have worked with Veterans who have shown me a gallon size baggie of prescription drugs that they were prescribed to take and 2/3rd’s of them say “may cause suicidal tendencies” and we wonder why our suicide rate is so high. Then they find alternative therapies that are helping and have their hope ripped from them by doctors who are not familiar with HBOT and the success our Vets have seen who have received this. How many more lost lives are these Doctors responsible for? It is hard to fathom the reasons why any qualified VA doctor would rob a patient a moment of hope, particularly when the VA has been demonstrably incompetent in providing an alternative. Kimi’s story, as reported by Debbie of AMW, serves as a daily reminder that we all need to take action to expose the lies, hypocrisy and arrogance of the VA. For many Veterans, the VA is a failed institution that treats our brave heroes with disdain. How can let this young woman’s desperate plea go unheeded? It is hard for me to watch this video, but Kimi’s experience is not unique. How many more Veterans need to suffer such indignity? And please, take the opportunity to visit our website where we have many resources and articles devoted to helping Veterans find alternative therapy programs for PTSD and TBI.